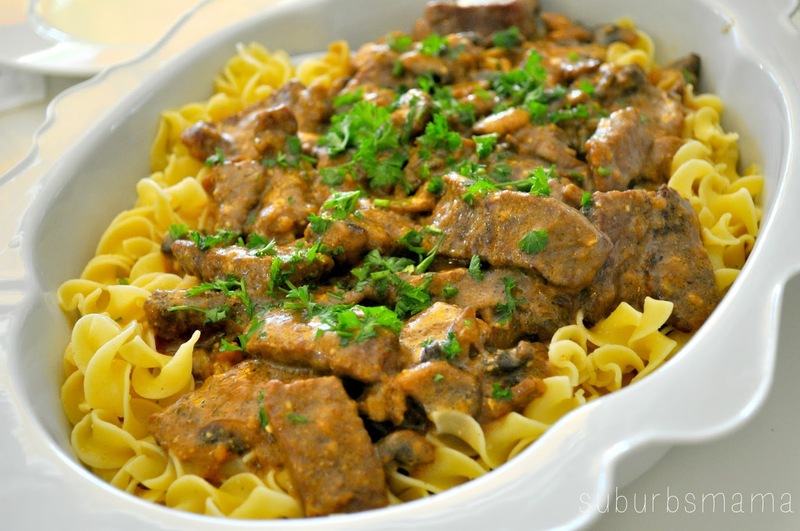 I have tried a few recipes of beef stroganoff and although they were good, I never loved them enough to repeat, so I finally decided to take matters into my own hands and create my own recipe. The result was fantastic. This is how I make this dish now and I wrote down the approximate measurements today as I was cooking since I had some requests. they truly devour the rest. It has so much flavor and the meat is very tender. Remove fat from the roast and cut into strips. Season with salt and pepper. In a large skillet, over medium heat, melt butter and oil. Add the beef strips and cook until browned, stirring often. Add the onions, garlic and mushrooms- sauté everything together. Once the onions and mushrooms are browned, add the flour with the juices and stir well. Add the chicken broth and mustard and bring to a boil. Turn the heat down to low and cover and simmer for one hour or until the meat is tender. Then bring the heat up to medium and add the sour cream and wine. Heat and stir. Add salt and pepper to your desire. Boil water and cook the egg noodles to package directions. Drain noodles (do not rinse) toss with olive oil and garlic salt. Spread the noodle in a serving dish, add the Beef Stroganoff on top of the noodles. I was just wondering how much sour cream to use.. it just says 1/2 sour cream.